Russia has been unusually present in my life recently. First there are some books I've been reading - have a look through my earlier posts, you'll see for yourself how I seem to gravitate to Russia-related topics. Next - my sister physically visits Moscow, sharing plenty of beautiful pics and stories afterwards. Finally, a huge, huge spike in readers from Russia (hi guys! It's good to see you here). 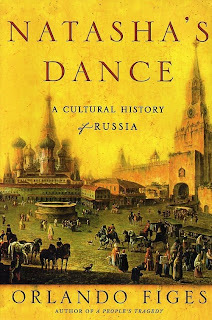 With all this going on, it's probably not surprising that my next reviewed book is also about Russia, this time seen through a cultural lens. Dostoevsky. Tolstoy. Stravinsky. Nabokov. Tchaikovsky. Chekhov. Pasternak. Solzenitzyn. Rachmaninoff. To name only a few... The names ring a bell, don't they? Russia has been generous when it comes to providing the world with great artists. Reading Natasha's Dance is a very good way of getting to know them slightly better. I swallowed the book within three days. That's something, considering its size - 600 pages, plus another 200 pages of notes and bibliography (no, I didn't read them. I'm telling you about this only to let you know that someone has done a piece of proper scholarship here). The whole volume reads rather smoothly, but if I were to express it in numbers, I'd say 70% were just alright, while the remaining 30% were absolutely brilliant. All according to my personal taste, of course. Let me elaborate. The 70% is the stuff that you can find in any encyclopedia (or wikipedia, for that matter) - dates, names, literary/musical/visual analysis. Nicely written, sure, but still - nothing outstanding. I am rather distrustful towards people who try to tell me 'what the poet truly meant', especially if it happens three hundred years after the poet died. I believe a piece of art is to be taken in individually and perceived according to a viewer's (reader's etc.) feelings, sensibilities, observations. People who tell me what I should see in a picture give me goose bumps. Nothing kills art quicker than conventional analysis... Especially analysis delivered in pretty sophisticated language (for example sections on classical music are pretty unintelligible to someone who has not received proper musical education. Truth to be told - they were to me). The 30% are 'the tasties'. The off-the-beaten-track screenshots of everyday life of 18th and 19th century Russia. Eating habits (gourmet feast within higher classes apparently were quite stunning). Social behaviours (e.g. a close look at domestic violence, or child upbringing). Great artists presented as blood-and-bone human beings. Ethnographic sketches on shamanistic tribes. That sort of thing. After all - who says that 'culture' is only created by the outstanding individuals? Well, some people (critics? scholars?) do, but I prefer the view that a nation's culture is the sum of its art, history, habits, attitudes and probably plenty of other things too. If you're a fan of Russian art, you probably won't need much persuading to read Natasha's Dance. If you aren't... well, if you trust my recommendation and read it, you might yet become one.